My son makes a final visit to Toys R Us. 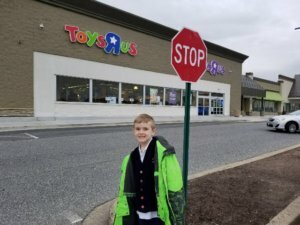 Collin stands outside a Toys R Us during our last visit to the store. When I recently learned via social media that Toys R Us might close all of its stores within the week, I felt an overwhelming sadness. Yet I couldn’t figure out why I was getting so worked up about a store. No one can deny that consumerism is changing. Brick-and-mortar businesses seem to come and go (mostly go, lately), especially as the seemingly limitless virtual marketplace continues to expand and offer us more product options at better prices delivered cheap (or free) and in record time. Borders, Blockbuster and Circuit City all closed their doors over the past decade. Those were all places I enjoyed visiting for entertainment while I was a teenager. The “death” of Toys R Us strikes people my age particularly hard because it was the place where our dreams were made when we were very young. “It was like Disney World,” my husband said. In essence, we are losing a piece of our childhood, one we hoped to share with future generations. 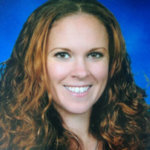 I can remember my mom taking my brother and me to Toys R Us for report card rewards, to buy presents for our friends, and sometimes just to “window shop” in the awe-inspiring, packed-in shelves that towered over us like skyscrapers. I will never forget the wall of hot pink that was the Barbie aisle, practically a sacred space for my eight-year-old self. My interest in toys faded a few years later, but I revisited the store when I became a mom. I’d dreamed up an entire world for the little person in my belly as I carefully inspected car seats, strollers, playpens, down to every bib. I fell in love with a Bohemian elephant nursery set for Teagan and drove an hour to another store to get it. 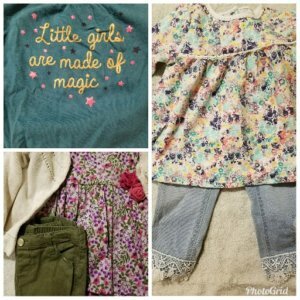 I fell in love with the Toys R Us Koala Baby clothes and filled their closets with my favorite pieces. As my babies grew, I got great deals on diapers and formula and would upgrade my baby gear during their big trade-in sales. 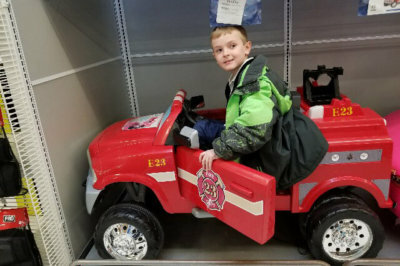 When my babies became kids, Toys R Us became just that: our go-to place to buy Collin’s Thomas trains, outdoor toys for sweltering summer days and family board games to get us through the long winter. The birthday celebrations were the greatest of all: a personalized phone call from Geoffrey the Giraffe and a parade around the store, complete with crown and balloon. Collin loved to hear his name over the intercom most of all. There’s a reason why people take their kids to Toys R Us. There’s something special about walking into a store, browsing, getting your hands on things, making a decision about what to buy, and walking out of the store with it in your hands — that day. Some of Teagan’s beautiful Koala Baby wardrobe. There’s something special to say about a store the size of Target that is only filled with stuff kids like. You can’t do that in six or seven aisles at Target, where your mom goes to buy furniture polish, crew socks and hot dog rolls. You can’t do that on the other end of a screen. The in-person Toys R Us experience is one-of-a-kind and supplies are running out. I decided to stop in Toys R Us for a March 12 visit, fully aware that this might be my last. I wanted to experience that innocent joy one last time, so I brought Collin along. When I told him that Toys R Us was probably shutting down, he did what any 8-year-old child would do: he cried. We walked into the store expecting to see everything marked down on clearance, the shelves picked to pieces. But the aisles were packed and tidy as always, and just about everything was still marked at full price. We poured through the Lego aisle, pretending we had all the money in the world and choosing our dream sets. I loved the Minecraft house. Collin wanted everything from the Lego Batman movie. We contemplated buying a rubber snake to prank people with but ultimately ended up with a foam sword and a denim and floral outfit for Teagan. “Our money can help them stay open!” Collin said. I didn’t have the heart to tell him it was too little, too late. “I’m sorry your store is shutting down,” Collin told the cashier, who was probably someone’s grandmother. She seemed frazzled and obviously so. With very little warning, she may have to start looking for a new job. The owner of the Marketplace Drive shopping center would have to find a new store to fill the enormous gap, just as they have to do for the space that once belonged to H.H. Gregg next door. The rest of us will have to choose between buying toys you don’t get to “try-out” online and buying from a limited selection in fewer than a dozen poorly-stocked aisles in a big-box store.